While the origins of the Greek economic crisis can be traced back several decades, it has been the past couple of years that have really seen Greece bearing the full force of a recessionary storm. Organisations have been massively aff ected by the economic and sociological impacts of the crisis and have the choice of either seeking strategies and remedies or facing an uncertain future. 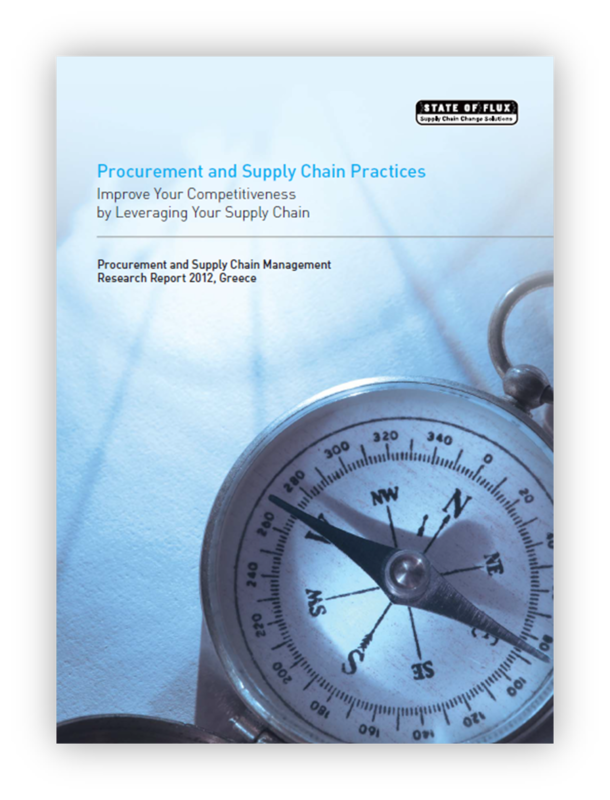 Procurement and supply chain management practices, when appropriately implemented, can deliver results that go directly to the top and bottom lines, mitigate risks and help to build the basis for sustainable investment and growth. State of Flux commenced an online survey and followup workshops in 2011, which were welcomed by over 130 organisations across 20 industry sectors. The results of this study suggest that there are pockets of good practice among Greek organisations, but equally there are a lot of both quick win opportunities and long-term strategies that procurement and supply chain professionals have yet to fully implement. Improve the capabilities of the procurement team. Ultimately, organisations must develop plans to improve the management of third party spend and achieve operational efficiencies. The positioning of procurement and supply chain functions is reported to have been improving since the financial situation for organisations worsened as a result of diminishing revenues. Procurement has been under pressure to contribute cost savings – an objective that is formally set by nine out of ten organisations that took part in our survey. There are diffi culties in measuring the benefits delivered by procurement and supply chain functions. This was reported as the second biggest challenge by respondents after lack of budget. Organisations appear to have processes in place for the operational side of purchasing, including spend authorisation and procurement-to-pay, but the development of processes in the more strategic areas of category management, contract management and risk management is lower. In risk management, in particular, organisations appear not to be suffi ciently proactive. This is refl ected in the fact that only one in four organisations includes risk mitigation in its function’s objectives. Lastly, organisations appreciate that results will come through people development and have highlighted people’s capabilities as their key improvement area in the future. Our survey indicates that organisations are now being more diligent in managing and controlling their third party spend. More than nine out of ten organisations in our survey regularly conduct an analysis of their spend, and three-quarters have put in place a programme of cost-savings initiatives. The top two initiatives are externally focused and call for either incumbent suppliers to reduce their pricing or new, less expensive, suppliers to come onboard. At the same time, however, more than half of the organisations in the survey are missing out on internal cost saving opportunities that spend management could deliver through total cost of ownership (TCO) analysis, better management of business requirements and demand, and addressing inefficiencies in the way categories of products or services are managed. Contracts management is an aspect of procurement that Greek organisations appear to be relatively good at based on the results of the survey. But the feedback from our post-survey workshops and our experience in working with global organisations on contract management projects have left us with doubts about the effectiveness of such initiatives (which appear, on the surface, to be better on average than those of global organisations we work with). Our post-survey discussions revealed some opportunities around leveraging third-party contracts to secure savings or mitigate risks that are not currently being addressed by Greek organisations. An area that stood out from the survey results is risk management. There are indications that risk management has started to gain prominence, although little action has so far been taken to put risk management processes into practice. There are certainly some pockets of good risk management activity among some of the organisations in our survey, including multi-sourcing, increased safety stocks and business continuity plans. However, little reference was made to policies on risk management, risk reporting, and collaboration with suppliers to jointly mitigate risks in the supply chain. Only 16% of organisations communicate their risk-related considerations to their suppliers. Whereas only a small percentage of the survey population reported formal supplier management processes, there is an understanding that not all suppliers are equal and each supplier segment requires different management practices. The majority of organisations segment their suppliers into different classes and revise the segmentation on a regular basis. The most frequent supplier management activity is sharing information such as demand and forecast data, market information and performance data. We have also noted an increase in organisations engaging their suppliers in collaborative efforts on cost savings and innovation, but not risk management. Little information is currently shared on strategic plans, strategic alignment and relationship strategy, while less than 10% request feedback from their suppliers regarding their performance (e.g. through 'voice of the supplier' surveys) or conduct 360 degree (two-way) assessments with their suppliers. Sourcing management is the area where all organisations appear to have standard processes in place. But these do not always include crossfunctional collaboration, which is where procurement can play a facilitating role. There appear to be some misconceptions about electronic procurement approaches, highlighted by both the low use of eSourcing and the perception among around half of respondents that eSourcing is not an appropriate way to buy products and services. This reflects the low awareness and education on eSourcing that was reported as the main challenge in adopting it. On the operational side of contract management, we noted again a low adoption of processes and automation in managing third party contracts during their lifecycle. The main challenges include high levels of off-contract and 'maverick' spend, as well as long contracting cycles. Lastly, the majority of organisations appear to have put in place procurement-to-pay management processes and systems. To date, technology has been used to automate the operational aspects of procurement. There has been a high adoption of inventory management and procurement-to-pay systems, which reflects the necessity of ERP systems in a modern organisation. Where organisations are lagging is in the use of tools that enable them to support more robust processes to manage their contracts, risks and suppliers. However, this is where technology adoption is heading. The main technology solutions that Greek organisations will be looking at using in the next couple of years include supplier performance management and contract management. The challenges that Greek organisations face during the economic crisis are not new to procurement professionals, even if the size and scale of those challenges appear bigger and more daunting than in the past. The main challenges include pressure for cost savings, restricted cash flow, low budgets and increased risk in the supply chain. The majority of survey respondents (63%) believe that better control and analysis of spend are essential in overcoming the current challenges. However, about six out of ten organisations do not believe that cost-saving initiatives, more robust procurement processes, training, risk management and adoption of technology can help them in the management of the economic crisis. This finding implies that procurement professionals have either lost faith in management practices that ought to help them in overcoming the crisis or they have not been convinced of the value and benefits of applying these practices in the first place.